Create a romantic way to share your feelings to your sweetheart on your anniversary, Valentine’s Day, or any special occasion. Choose to send this Personalized Message in a Bottle directly to them or hand it to them personally. You choose your own creative way. Or, you may wish to send your Message in a Bottle along with a teddy bear personalized just for them to really make their heart skip a beat. The 6 1/2" glass bottle comes with sand, seashells, beach umbrella and poem printed on parchment paper, then rolled, tied with a ribbon and corked on top. 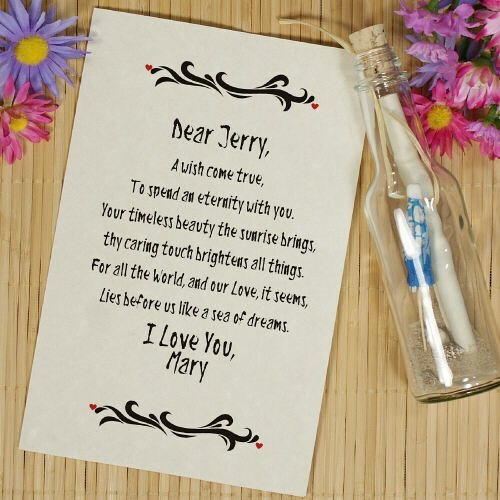 This Message In A Bottle can be shipped to you or directly to your sweetheart. Free Personalization is included! Personalized with any two names. Additional Details 800Bear.com has many Personalized Romantic Gifts that are perfect for her or him. Shop 800Bear.com for all your Personalized Plush Animal needs.